The Bioexcel hunting knife features straight edge. Ideal for anyone who spends time in the wilderness or likes to hunt, this Damascus skinning knife features stainless steel blade. This deer skinning knife's bone handle with a non-slip texture is for added control. Skinning knife can be easily stored in the leather sheath for easy and safe carry. Top quality stainless steel contains more carbon, giving it excellent hardness and edge retention. Designed for true outdoors adventurers, Bioexcel offers a wide variety of hunting knives, skinners, game sets, machetes, axes, and even gentleman's knives. Hand made hunting knife from Bioexcel is designed to be a skinning knife. Overall length of this hunter knife is 6 inch. 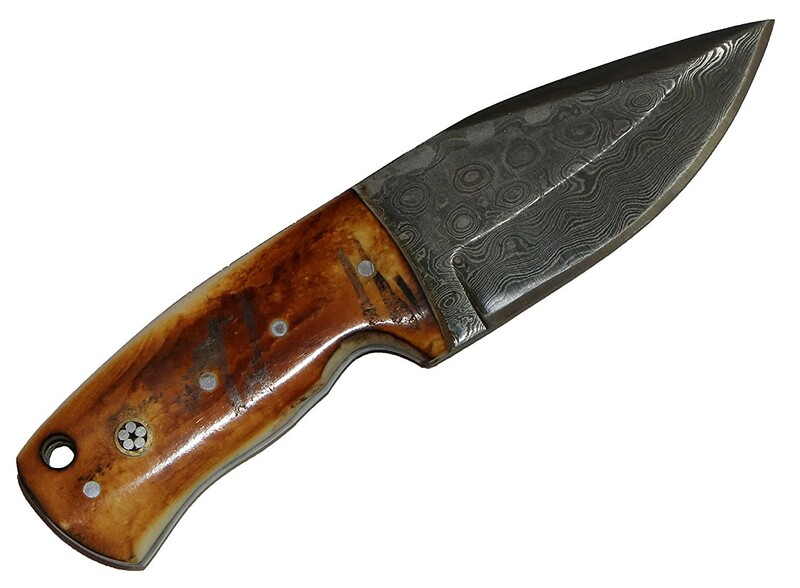 Handmade Damascus blade is made of stainless steel for excellent hardness and edge retention. Bone handle of hunting knife is perfect for tight grip while hunting. Pack includes skinning knife sheath for easy and safe carry.